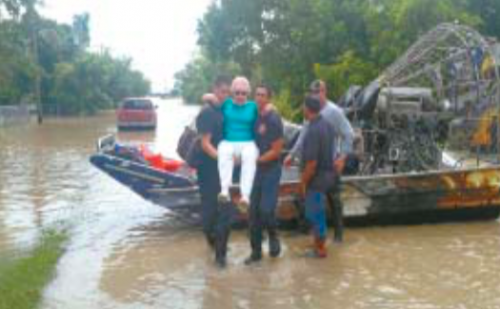 The Channelview Fire Department reported that they rescued 35 persons, in a borrowed airboat. Highlands Fire Department responded to multiple calls, working on both sides of the river because some departments were short of rescue boats. Highlands recently upgraded their boat with a 50 HP motor, necessary in the rapid flow of water in the San Jacinto River. Highlands FD worked on rescues in Banana Bend, Highlands Shores, and even Rio Villa on the west bank. As of Tuesday, waters had crested and the calls were subsiding, chief Harvey Little reported. Other flood damages included closing part of the Houston Ship Channel on Sunday. The Lynchburg Ferry has not run for three days, and may not resume for several more. About 12 barges in the area around the I-10 bridge were floating loose, and Kirby Inland Marine worked to re-secure them. More than 500 Channelview High School graduates received their diplomas during graduation ceremonies on May 29 at the M.O. Campbell Center in Aldine. Pictured are the top 10 students in the senior class, from left and in rank order, Valedictorian Elizabeth Tenorio, Salutatorian Jessica Telles, Andrea Tellez, Cesar Perez, Lesly Cruz, Christan Meza, Lauren Easton, Michael Gonzales, Blanca Vazquez and Rosario Armenta. San Jacinto Pilot Club awarded $10,000 in college scholarships to local students. 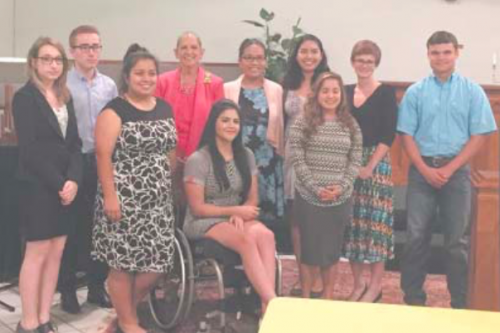 Recipients are pictured: Brennen Baird, Madeline Colonga, Maria Corea, Ciara Espinoza, Jahzeel Galvan Armando Garcia, Valeria Mercado, Kasi Schultz, Taryn Surratt, Oscar Teran, and Jocelyn Yanez. Full list of Recipients: Adriena Aguirre-Hernandez, Brennen Baird, Jayair Chatman, Madeline Colonga, Maria Corea, Ciara Espinoza, Jahzeel Galvan, Armando Garcia, Valerie Mercado, Kasi Schultz, Maria Sorto, Taryn Surratt, Oscar Teran, and Jocelyn Yanez. The event was held at Woodforest Presbyterian Church Thursday evening May 19, 2016.